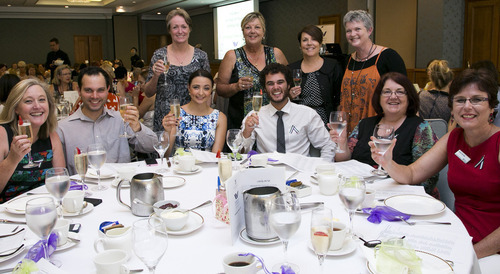 The Midland Information, Debt & Legal Advocacy Service Inc (MIDLAS) was delighted to be a part of Funds for Freedom’s 2013 International Women’s Day celebrations in Perth on Friday, 8th March 2013 at the luxurious Duxton Hotel. MIDLAS was thrilled with the uptake, and indeed the interest from the entire community out in force to “celebrate the achievements of women while remaining vigilant and tenacious for further sustainable change.” In fact, Australia is hosting nearly 200 registered International Women’s Day events across the country, falling only behind the UK (418) and the USA (211), an impressive commitment to a wonderful cause for a country with little over 20 million people. At this year’s event, Funds For Freedom arranged for Diana Warnock, who is Patron for Women’s Council for Domestic & Family Violence Services to present. Diana was named Australian Humanist of the Year in 1999 and is an inaugural entrant to the WA Women’s Hall of Fame. It was inspiring to hear from Diana and the work she is involved in, not just for the benefit of women, but for all members of society. International Women’s Day is an important day in the calendar to mark the economic, political and social achievements of women. Did you know that New Zealand and Australia were among the first to grant women the right to vote? New Zealand in 1893 and South Australia in 1895 (both as a self governing British colonies) and then Australia, as a federated nation in 1902. Many Western world leaders did not grant full women’s suffrage until after World War II, including France in 1944 and Switzerland in 1971. In this regard, we should be very proud of ourselves and our Oceania neighbours for taking the first steps for women’s rights into the 20th century. And so, we want to know what you did, or what you pledge for IWD 2013. The theme for this year’s internationalwomensday.com website was “The Gender Agenda: Gaining Momentum” and the declared theme from the UN was “A promise is a promise: Time for action to end violence against women” which was of particular interest to MIDLAS and the work we do here with our specialist Domestic Violence Legal Service. Many countries, organisations and community groups establish their own agenda for International Women’s Day. Tell us over FaceBook or Twitter whether you had your own agenda for IWD. Remember to use the #womensday 2013 hash tag! Next Post: Mark your diaries; it is Youth Homelessness Week!